The aim of this project is to create an ideal administration tool able to prevent running any Windows application. The project is targeted at the corporate audience and, among other things, sets a goal to develop powerful features for remote administration of all domain computers at once. Project launch date: October 20, 2008. Even though there are still a few things left on our to-do list, beta testing is now over and a commercial product is available for purchase. Blocking rules are very flexible and allow you to block applications by wildcard, filter them by user name or group, create a whitelist and detect files by CRC. The CRC algorithm is extremely fast as the checksum is not calculated for a whole file. Test results for about 3,000 executables show that a false positive can occur only if a file was patched after compilation (for example, by a virus). That, in its turn, emphasizes the fact that Process Blocker is not designed to be anti-malware software. Be careful when using Process Blocker and wildcards in particular. That might lead to blocking important Windows executables and, as a result, cause an operating system malfunction. 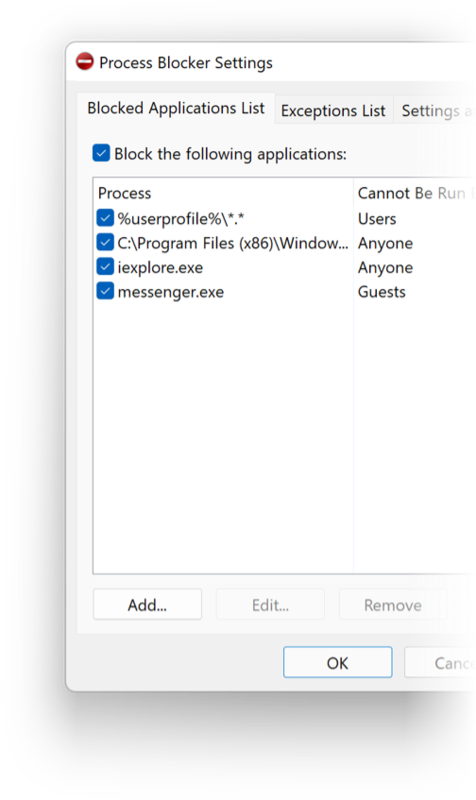 Process Blocker is compatible with Windows XP and later. Windows 2000 support was dropped in version 1.0. It may be added back though if enough requested for that are received. We are looking for new ideas for Process Blocker and of course are interested in fixing bugs if you find any. Feel free to send us your reports to contact@processblocker.com. Please also direct to the above e-mail any project-related questions you may have – we will try to answer them all. We do not take any responsibility; the application is distributed "as is". Process Blocker is developed by Softros Systems, Inc. Try our Time Server Software for Windows, Windows Autologon Software and cross-platform LAN messaging software product.